Wood siding simultaneously improves the aesthetic appeal and long-term value of your home in Fairfax, VA, McLean, VA, Bethesda, MD, or anywhere else in the Washington, D.C. area. The home improvement experts from Shiner Roofing, Siding and Windows are proud to be the siding contractors of choice in the Northern Virginia region since 1981, and installing siding made of wood or vinyl designed to look like wood is one of our specialties. Wood siding evokes the classic beachfront look of vacation destinations like Cape Cod and Key West. While those two regions are deeply associated with wood tiles, shingles, and shake, the look has migrated to other parts of the country as well. If you want to give your home in Vienna, Arlington, Oakton, or elsewhere in Northern Virginia, Maryland, and Washington D.C. a rustic, weathered look, or a clean, well-maintained look with a splash of vibrant color – or anything in between – turn to Shiner for professional, fast, and considerate home improvement service. Shiner can cater to any aesthetic taste when it comes to home siding, and we are proud members of the Cedar Shake Bureau. That means we are acknowledged experts in the selection of quality wood and are recognized as practitioners of master craftsmanship. In addition, we consistently earn an A+ rating from the Better Business Bureau and our workmanship on all siding jobs is backed by a five-year warranty. We even offer a warranty on some repair work. 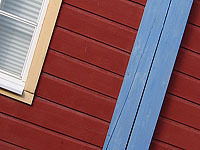 Be sure to contact Shiner when you begin to consider wood siding contractors in the Washington, D.C. region.